You make your final approach and the only sound you hear is your heart beating in your chest. The stands along the poolside are virtually silent. It’s you alone on the diving board; the center of everyone’s attention. One, two, three bounces on the board and you lift yourself into a spinning somersault while trying to finish with a twisting motion as you break the surface of the water hoping your entry doesn’t create too big of a splash. Diving is certainly not an athletic event for the faint of heart. It takes nerves of steel, a nimble body and a relentless pursuit of perfection. Naugatuck senior divers Katie Brown and Brin Battisti have been posting personal bests this season and are one of the main reasons that the Greyhounds have a good chance of competing with the top teams when the Naugatuck Valley League battles it out at the championship meet in a few weeks. 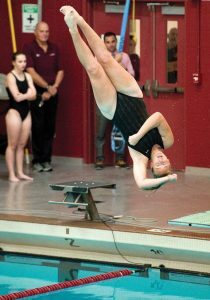 “If we can go two and three we can get our team around 50 points and that would be huge going into the swim portion of the meet,” said Brown, who nailed a season-high score of 221.47 against St. Paul on Sept. 28. Battisti has also increased her scores this season, posting a season-best of 172.80. The CIAC and USA diving have five categories of dives: front, twists, back, inward and reverse. Divers’ scores on each dive are multiplied by the degree of difficulty to get a final score. There is no doubt that a diving coach can bring out the best in those who possess the will to catapult off a diving board. Woodland diving coach Doug Mariano has seen his share of champions in his six years coaching at Naugatuck and eight more at Woodland. This season, Mariano has a pair of senior divers in Alyssa Van Alstyne and Adrianna Byczko to work with at Woodland. Van Alstyne and Byczko have both posted winning scores this season. Van Alstyne’s resumes includes diving wins during meets versus Waterford on Sept. 12 and Torrington on Sept. 28 with scores of 195.25 and 181.43, respectively. Byczko won the event during a Sept. 18 meet against St. Paul with a score of 169.80. Byczko injured her ankle a couple of times when she was a cheerleader, so she decided to give diving a try. She constantly tries to push herself on the board and expand her skills. When it comes to diving, Mariano said having gymnastic experience can give a diver a leg up, but it’s not a prerequisite. Brown’s background in gymnastic helps in another way, being able to handle standing out on the board with all the attention on her while the pool is virtually silent. “Actually, I kind of like that feeling,” Brown said. Aside from their coaches, the Greyhounds also can look to Naugatuck High Athletic Director Brain Mariano, who is no stranger to the diving board, for some advice. Brain Mariano, who is Doug Mariano’s son, won the 2001 Class L state championship in diving and the 2002 national championship. He went on to dive for Indiana University after graduating from Naugatuck High. As the NVL swim season heads into the homestretch, having seasoned divers will be a luxury for teams when the league comes together to crown a champion. “We found out a lot about ourselves when we swam against Sacred Heart and Oxford, two teams that finished ahead of us (at NVLs) last year,” Naugatuck head coach Jim McKee said. “We were able to score in every event. That means your depth is where it needs to be.